Along with my colleagues, I did visit Hampi last weekend. It was rather an un scheduled trip, planned in less than 48 hours. We wanted to attend a colleague's engagement ceremony in Bellary, Karnataka and we were not willing to travel all the way to Bellary from Hyderabad (350+ kms) just to attend one function. So the nearest tourist place being Hampi, it was decided to visit Hampi. Check out some videos first. Video 1: Musical Pillars at Vittal Temple, Hampi. 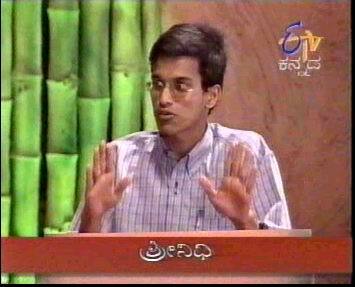 Note: The explanation for the videos are in Telugu language. Inconvenience caused by this is deeply regretted. This one is lengthy. Ignore the noise in the video. No explanation here. We rented a guest house in Hampi, had refreshments, hired a guide (His name was Nagesh) and spent half day seeing key places in Hampi. Evening we went to TB Dam near Hospet. The local residents of Hampi have kept all other professions aside to encash from tourism boom. Hampi has gained popularity after UNICEF recognition and Jackie's movie, "The Myth". One child was trying to sell maps to us and was saying "ಬೋಣಿ ಮಾಡಿ ಸಾರ್ " (Kannada for: be my first customer and make my day). I asked him its afternoon 2 PM and is it your first sale still? He replied that he just returned from school and just started selling his goods. Most of the houses are converted into Guest Houses and are rented to tourists and roof tops and open spaces are used as restaurants. Bicycles were available for rent at Rs 40 per day, a cheap and useful vehicle to roam around and explore the place. We left Hampi next morning, went to attend the function in Bellary and left for Hyderabad later in the afternoon. Below are the photos we took during our Hampi visit. The first slide show contains only those photos showing Hampi, while second slideshow contains all photos, including individual photos of team members of our Hampi visit. Nearly 200 images...ignore if you don't have patience/interest in seeing all of them. Tunga Bhadra river (ತು೦ಗ ಭದ್ರಾ ನದಿ)was almost empty leaving no room for water sports while TB Dam at Hosakote was good. Ideally one should spend minimum of one to two days at Hampi to get maximum benefit. Also when you go on a tour, the time spent on site seeing should exceed time spent on travel. But in our case, out of 48 hours we spent on tour 24 hours were lost in travel, 12 hours in sleep and refreshment and only around 10-12 hours were spent in actual site seeing. But since it was not planned in advance and still served the basic purpose of visiting Hampi there's no regrets or complaints about it. The trip gave a break from office and served as a refreshment. Internet backbone for file uploading: Airtel Broadband. What is there in Hampi? 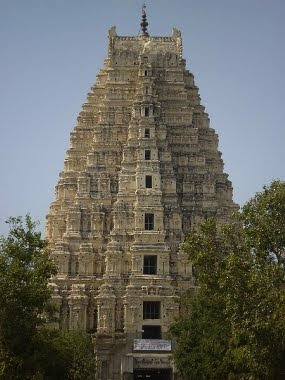 Hampi contains mainly rocks and temples and monuments dating back to 15th century which have historic significance. The inherited heritage of the then kings are now under ruins and tell their story with silent tears. Hampi is around 350 kms from Bangalore and 450 kms from Hyderabad. Bellary is the nearest airport and railway station, from where Hampi is around 60 kms. Avoid going by road (till Bellary) as the roads are very very bad. Hospet is the nearest town for hotel accommodation, In Hampi many people have converted their house into guest house and rent it to tourists, which is a relatively better option (both in terms of cost and convenience). Bicycles and bikes are available on rent for local site seeing. Depending on season/off season, your bargaining abilities, luxuries offered and other factors, accommodation at Hampi may cost anywhere between 100 to 500 Rs per person. Virupaksha temple is the main temple, while other places are: Vittal temple, Kadalekai Ganesha (Groundnut shaped Ganesha), Lotus Mahal, Veerabhadra idol etc. Each piece of stone has its own story hence the list is endless. Only in main Virupaksha temple photography and videography are charged, rest of the Hampi is free to shoot. TB Dam near Hospet is another place of interest, go there during evening to see musical fountain. Carrying your own water will save you lot of money. A Rs 12 one liter bottle is sold at Rs 15-20 in Hampi. If you’re a foreign national go with an Indian friend if possible. The locals here at Hampi adopt all tricks and techniques to extract maximum money from foreign nationals. Hope this was useful. Additional photos and videos and description at my blog. Useful review. Only issue was I got here from Mouthshut review and there you said Roads are pathetic; but I was not sure if it was Bangalore to Hampi or Hyderabad to Hampi. Now it is confirmed that it is Hyderabad to Hampi. That was 7 months ago. Hope roads might have improved now..